Cubital Tunnel Syndrome is a condition caused by pressure on the ulnar nerve at the elbow. Nerves carry messages between the brain, spinal cord, and body parts. When a nerve is compressed, it cannot function properly. Cubital Tunnel Syndrome is the second most common nerve entrapment syndrome, after Carpal Tunnel Syndrome. The Ulnar Nerve carries signals for sensation in one half of our ring finger and our small finger and to our muscles that perform fine hand movements. Individuals with Cubital Tunnel Syndrome have difficulty handling objects and performing gripping motions. Individuals may feel pain, numbness, and a “tingly” sensation, similar to when the “funny bone” is hit. When the" funny bone " is hit, the odd feeling is actually caused by the Ulnar Nerve. The Ulnar Nerve runs from the side of our neck, down our arm, and to our fingers. The elbow is the most common site for Ulnar Nerve compression. At the elbow joint, the Ulnar Nerve passes through a passageway, formed by muscle, ligament, and bone, called the Cubital Tunnel at the inside part of the elbow. If the Ulnar Nerve is compressed at the Cubital Tunnel, it will send faulty messages as it travels down the forearm into the hand and fingers The Ulnar Nerve supplies the sense of feeling to the outer half of our ring finger and our little finger. The Ulnar Nerve also sends messages to some of the muscles that move our hands and fingers. These muscles are called the Interossei and the Adductor Pollicis. The Interossei muscles in the hand work to move our fingers together and apart. When the fingers and thumb spread open, the Adductor Pollicis moves the thumb back towards the hand. These hand and finger movements are especially important for manipulating and holding objects. Cubital Tunnel Syndrome can result from Ulnar Nerve compression. Its cause is unknown but several factors appear to contribute to it. Its most common cause appears to be from repeated elbow movements. 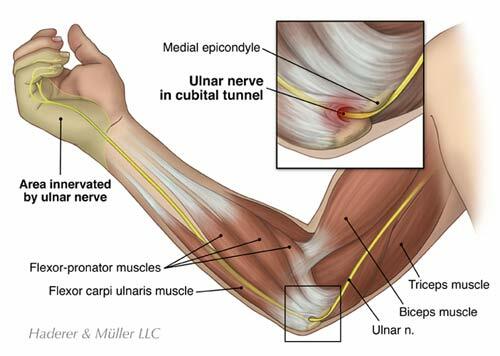 The Flexor Carpi Ulnaris muscle can press on the Ulnar Nerve as it runs through the Cubital Tunnel. The Ulnar Nerve can also become irritated from pressure on the elbow. This can occur when the elbow is leaned on or pressed on for long periods of time. Elbow fractures, trauma, bone spurs, swelling, or cysts are additional factors that can cause Ulnar Nerve compression and lead to Cubital Tunnel Syndrome. Cubital Tunnel Syndrome frequently causes numbness and tingling in the ring finger and little finger. Your symptoms may come and go. They may happen more often when your elbow is bent, such as at night when sleeping in one position. You may experience poor finger coordination and a weak grip. This may interfere with activities such as holding objects in your hand, using a keyboard, or playing an instrument. If the Ulnar Nerve compression is not treated it can cause muscle deterioration and lead to permanent impairment. You should always contact your physician if the symptoms of Ulnar Nerve compression last more than a few weeks and interfere with normal activity. 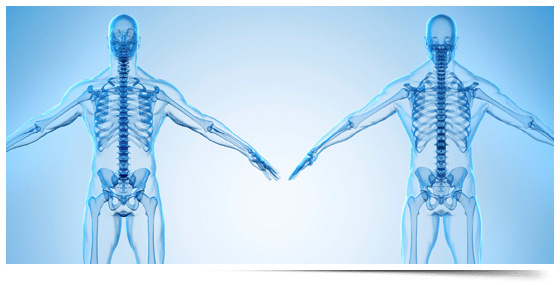 You doctor will perform an examination and review your medical and activity history to make a diagnosis of Cubital Tunnel Syndrome. Your physician will attempt to find where the Ulnar Nerve is compressed and will examine your forearm, elbow, hand strength and movement. 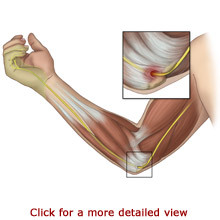 Your doctor may tap on your Ulnar Nerve in the cubital tunnel to see if it reacts and will test for sensation. The examination may cause a bit of discomfort as the physician is looking for the cause of the symptoms. Your doctor may use imaging tests to identify structural factors, such as bone spurs or arthritis, which may contribute to nerve compression. These tests can include X-rays, Computed Tomography (CT scans), or Magnetic Resonance Imaging (MRI). An X-ray uses a camera to take a picture of the elbow area to show the bone’s condition. CT scans take pictures in layers, so it produces images in the form of slices that make up the elbow, like the slices that make up a loaf of bread. MRI scans provide a very detailed view of the elbow complex. Like the other imaging tests, the MRI equipment focuses on the area to be examined and takes pictures. All of these imaging tests are painless and require that you remain very still. In some cases, the physician may use nerve conduction studies to measure how well the Ulnar Nerve works and to help specify the site of compression. Electromyography (EMG) is usually performed with nerve conduction studies. This test examines the nerve’s input into the muscles. The test may feel uncomfortable, but only during the actual test then resolves quickly. Most cases of Cubital Tunnel Syndrome respond to non-surgical treatments. Treatment typically includes activity restriction, rest, and pain relief. You should avoid repetitive elbow movements and avoid leaning or putting pressure on the elbow. In other words, you should refrain from the movements and postures that cause discomfort. You should take frequent breaks to rest when performing such movements. Elbow splints may be worn to keep your arm straight, especially while sleeping. 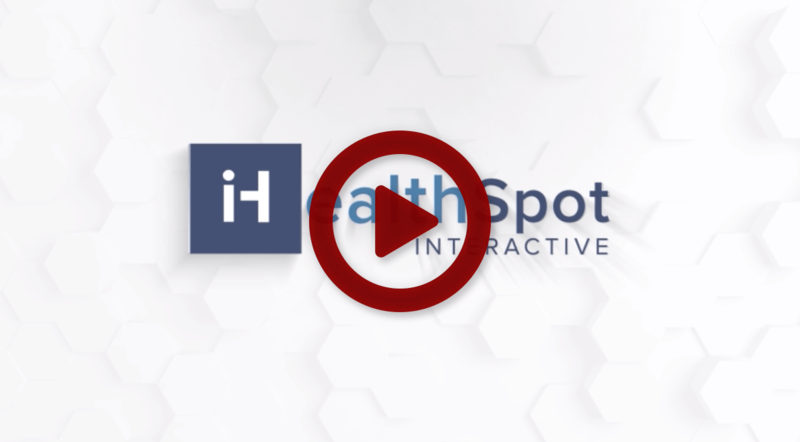 Anti-inflammatory medications may provide pain relief. Some physicians prescribe occupational or physical therapy. The occupational or physical therapists focus on gentle exercises to help the Ulnar Nerve slide through the Cubital Tunnel. The exercises may help keep the forearm and wrist muscles healthy while preventing joints from becoming stiff. Your doctor may recommend surgery for you if you do not receive relief from non-surgical treatments. Surgery can remove pressure from the Ulnar Nerve and prevent further damage. Your surgeon may also recommend surgery if you have muscle wasting. The surgery may be done as an outpatient procedure or may require an overnight stay at the hospital. You may be sedated for surgery or remain alert with a regional anesthesia that blocks the feeling in your arm. 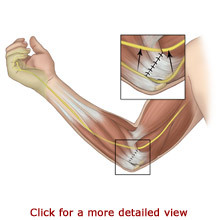 The surgeon has various options for relieving the pressure on the Ulnar Nerve. In one procedure, the “roof” is removed from the Cubital Tunnel. This method is called simple decompression. 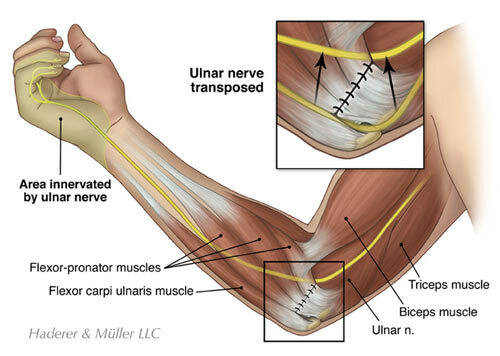 The most common surgical procedure is called an Anterior Transposition of the Ulnar Nerve. In this procedure, the surgeon makes an incision at the elbow and moves the Ulnar Nerve from behind the elbow to a new place in front of the elbow. If the Ulnar Nerve is relocated under the skin and fat but on top of the muscle, the procedure is called a Subcutaneous Transposition of the Ulnar Nerve. When the Ulnar Nerve is placed under the muscle it is called a Submuscular Transposition of the Ulnar Nerve. The surgeon considers many factors when selecting which method to use and will discuss the appropriateness of each with you. Following surgery, a splint is typically worn on the elbow for a few weeks. Individuals who receive a Submuscular Transposition of the Ulnar Nerve may need to wear a splint for a longer time, from three to six weeks. Occupational or physical therapy is recommended to regain strength and motion in the arm. If you require surgery for Cubital Tunnel Syndrome it may take several months to recover, but generally you can achieve good results. Individuals with muscle or nerve damage may take a longer time to recover. Nerves take a long time to heal. Nerves regenerate at about one millimeter a day. For individuals with severe nerve or muscle damage, complete healing may not be possible, and they may have some symptoms even after surgery.